Rid Those Split Ends. - Jodi Metcalfe - Blog. I have split ends almost every woman does, start mending and replenishing! This is a common condition which proves to be the devil of every girl's life! Split ends are most often seen in long hair but also found in shorter hair that is out of condition and is an affliction of anyone trying to grow their hair. The problem can be solved with good hair maintenance so check out this article! Split ends, (or trichoptlosis), are the nightmare for every self-respecting woman's life! They happen when the protective cuticle has been stripped away from the ends of hair fibers. Split ends are more likely to develop in dry or brittle hair, and typical causes of damage include excessive dying or vigorous brushing. 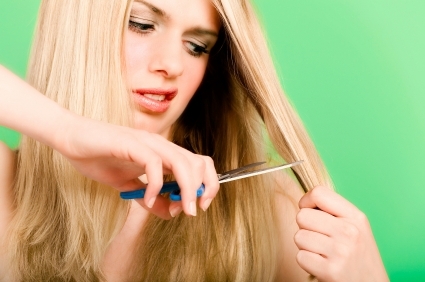 Once the hair cuticle is removed, it is impossible to replace. Typically the hair splits into two or three strands, and can be as long as two to three centimeters in length. The best treatment is to cut off the split end of the damaged fiber. 1. As your hair grows, the natural oils from the scalp can fail to reach the ends, making the ends of the hair more vulnerable than the roots. 2. The ends of your hair have had a long exposure to the sun, gone through many shampoos and been overheated by hairdryers and straighteners, which results in dry and brittle ends which are prone to splitting. 3. Not trimming your hair regularly is possibly the main cause of split ends. Prevention is better than a cure! 4. Damage due to colouring when done to excess also causes dry brittle ends. 5. Poor quality brushes and combs can also cause this problem. It doesn't necessarily means that have to go to the salon every week to keep your split ends in check. In earlier times, woman used to burn off their split ends themselves! And when I heard this I thought of bringing this revolution again into this Era, brought something new to this fashion & beauty industry so started cutting hair with Candle, its cool, fun & creative! Imagine using fire instead of Scissors, but you don't have to scared I will not advising you to do this at home and get entry into Records book. Hey! Not to worry, there are easier ways to get rid of your dead ends before they split further... DIY (do-it-yourself) hair trims. Don't be afraid, most of women do it! These DIY hair trimming tips are for woman who are happy with their hair; for those who don't need a re-style, but simply want to freshen things up with a 'homegrown' sort of look. Still! If you are in any doubt, leave it for the professionals! Take small sections of hair and carefully twist them in a gentle downward motion. Any split ends will automatically stick out. Carefully snip into the twist with sharp scissors. Don't cut right through; just cut into the thickness to remove the damaged cuticles and give a natural layered effect. Be careful to cut roughly the same amount from each twist. Remember, sometimes the simplest, and least expensive, ideas are the best. So get trimming! 1. Use specialist products that are designed to seal the splits temporarily in order to catch any splits that are shorter than the length you want to cut your hair to and to allow your hair to grow a little longer before you trim. 2. Go for deep conditioning treatment every week, if possible and especially if your hair is prone to splitting, chemically treated or treated by ceramic straighteners. Conditioning is mandatory every time you have a chemical. 4. Avoid excess heat and too much brushing and combing and please don't brush, scratch or shampoo hair and scalp before any chemical service. Never hesitate to Invest in quality combs and real bristle brushes. 5. Do shampoo your hair after a workout or strenuous exercise. The salt from perspiration will erode your hair. If you work out more than once a week, consult your stylist for your particular needs. What ever you do, if you want to keep your hair long, don't ignore split ends because, as they split they also break away, meaning that your hair is in effect getting shorter every time you brush it and also means that your hair population is going down!